Walk with devotion and reverance! The most exalted and revered Dark Angels heroes who took part in many campaigns and served the chapter faithfully are described here. Unfortunately they have yet to be acknowledged within the official rules of the Codex Dark Angels. Elite of the Elite: To take Gabriel in your army atleast one unit of Deathwing terminators must be included. In addition one Fast Attack slot may be replace by an additional Elites slot in the Force Organization chart. Hunter of the Fallen: When an exalted warrior such as Gabriel appears on the batlefield there is usually a high chance of some lead towards the Fallen. Add +1 to the roll for Hunt the Fallen Rule. This value is cumulative with other characters who have the same rule. Mass teleport Assault: All Deathwing units roll for reserves as one when Gabriel is present. Weapon Master: Gabriel is a master at close combat. In an assault he can choose whch of his weapons to use. Player must choose one weapon as the main weapon at the beginning of the assault phase and all but one close combat attacks are dealt with that weapon. A single attack may be dealt with the second weapon. 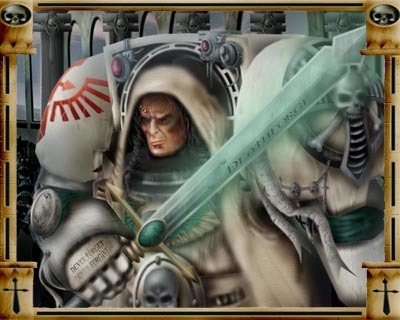 Gabriel took over command of the Deathwing company when the then master of Deathwing Azrael was elevated to the rank of Supremem Grandmaster, in 917M40. He had led the Third battle company with distinguish earning his subsequent honorific title of "Seeker of vengeance" by battle field prowess. Gabriel displaying his Sword of the Unforgiven, his badge of office as he speaks to his company prior to a mass teleport assault. Gabriel is the current master of the first company of the Dark Angels. He holds a personal rank of Grandmaster and the honorific title "Seeker of Vengeance"
Wargear: Sword of the Unforgiven, Glove of Retribution, Tactical dreadnought Armour. Sword of the Unforgiven: This is a master crafted power sword. Glove of Retribution: This is a master crafted powerfist with a built in master crafted grenade launcher capable of firing either frag or krak grenades. If the grenade launcher is fired during a turn, then the powerfist cannot be used on that turn in close combat.